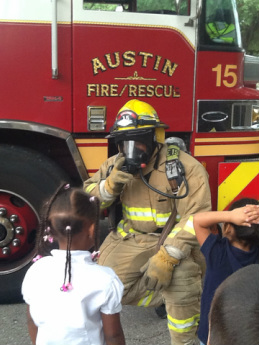 be a firefighter on Career Day. Oak Springs is an East Austin school serving a majority of scholars from the Booker T. Washington Housing Complex. Our school's community is working together with the faculty, staff, and administrative team to ensure scholar success. At Oak Springs, we are working to increase scholar achievement in reading, math, and writing. To that end, we use teaching strategies and research that access multiple intelligences and all modalities of scholar learning. We are also working to improve citizenship and social skills and to implement effective school-wide discipline and citizenship plans. In the coming year, we hope to increase parental involvement and communicate consistently and positively with parents and scholars. To support our scholars, we regularly involve parents in school activities that increase student achievement. We plan to implement and evaluate an incentive plan to reward parents and scholars for parental involvement in school activities. Other goals include the development, implementation, and evaluation of the after school program and increasing student attendance.